Click the play button to watch a video from Wilson County Schools technology camps. A'yanna Stevens, a fourth-grader from Wilson, releases a balloon-powered car while participating in a technology camp at Barnes Middle School last week. Freya Mooreman, a sixth-grader from Wilson, punches a release button as a water and air rocket she and team members made is sent skyward at a technology camp held at Barnes Middle School. Lydia Simons, a fourth-grader from Wilson, works with a Merge Cube and tablet while participating in a technology camp at Barnes Middle School last week. Kennedy Graves firmly held the point of a compass and etched a perfect circle on a Styrofoam plate. “You have to try to be accurate. If you’re not, then you can try again,” said the 10-year-old, who is one of 180 Wilson County children participating in technology camps this week at Darden Middle School. 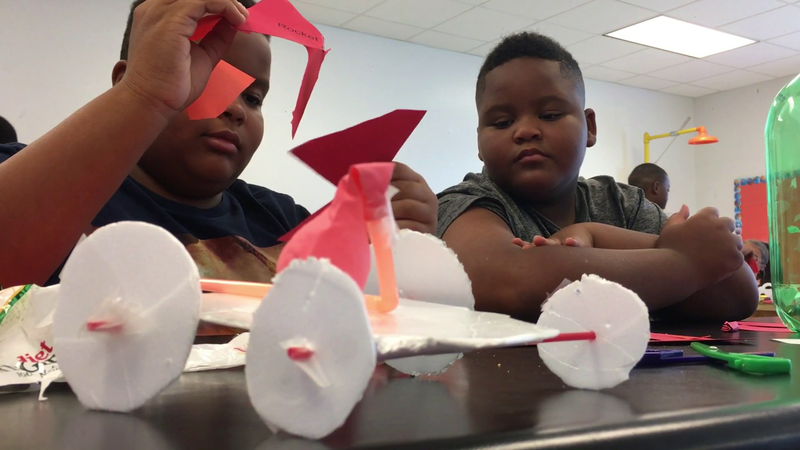 Graves was making wheels for a balloon-powered car, one of several mind-challenging projects in the rocketry portion of the day camp. “It has been very fun. I am creating new ideas and getting creative to build even bigger things,” Graves said. Later in the day, children affixed tail fins to soda bottles and launched them into the sky with water and air pressure. The three-day camps are for children from third through 12th grades. Natalie Mercer, instructional technology facilitator at Darden Middle, was a leader in the Creepy Camp Out breakout camp, where students solved various problems and puzzles. Chris Beneck, Wilson County Schools technology facilitator at Hunt High School, said each child gets to go to all three camps during the course of the week. Beneck said the infusion of electronic technology and computer applications into camp activities has changed the way camps are conducted. “When I became an educator 23 years ago, none of this was even a light on the horizon,” Beneck said. Beneck started teaching when chalkboards and overhead projectors were high technology. The use of iPads and other electronic, programmable devices is a core component to learning in today’s schools. “They have absolutely reached out into every area of education at this point,” Beneck said. Among the more popular activities in the STEAM lab were Sphero Minis, robots controlled through a computer application. “At its base level, it is a radio-controlled device run through Bluetooth so you can drive it,” Beneck said. Students drove the ping-pong-sized balls down the hallway at Darden like they were radio-controlled cars of yesteryear. Using various levels of programming, students can use coding to perform tasks with the Spheros. “I can alter its complexity for the age group that I am working with,” Beneck said. In the STEAM camp, six students sat at a table with an iPad in one hand and a Merge Cube in the other. Each student was totally engrossed. The camera feature built into the iPad orients itself to the Merge Cube. “It takes their cube and basically turns it into a piece of land and they are able to build blocks and they are able to dig and see the core of the land and build whatever comes to mind,” Mitchell said. Some apps have games and others have educational activities. One turns the cube into a human skull and then it shows students what the different parts are called. Camper Lydia Simons, 10, used her Merge Cube to fly a plane through a cave. Cara Patterson, technology facilitator at Elm City Middle School, said the camps enable students to think outside the box. The free camps are sponsored by Wilson County Schools.